The liquid in glass thermometer, is the most commonly used device to measure temperature and it is inexpensive to make and easy to use. The liquid in glass thermometer has a glass bulb attached to a sealed glass tube (also called the stem or capillary tube). A very thin opening, called a bore, exists from the bulb and extends down the centre of the tube. The bulb is typically filled with either mercury or red-coloured alcohol and is free to expand and rise up into the tube when the temperature increases, and to contract and move down the tube when the temperature decreases. In the Liquid In Glass Thermometers (LIG) the thermally sensitive element is a liquid contained in a graduated glass envelope. The principle used to measure temperature is that of the apparent thermal expansion of the liquid. 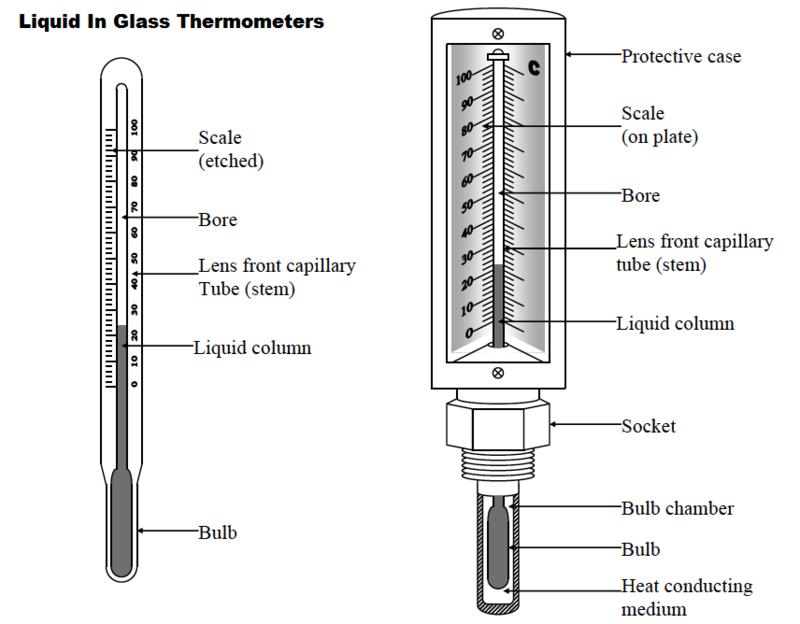 A typical liquid-in-glass thermometer is shown in the figure below. The background of the glass tube is covered with white enamel and the front of the glass tube forms a magnifying glass that enlarges the liquid column and facilitates with reading the temperature. In Below Figure (Left), an all glass thermometer is depicted, with its scale etched into the stem. Liquid in glass thermometers are fragile and for industrial use, the thermometer is mounted in a protective housing and the scale is engraved on a separate plate that is part of the protective case. 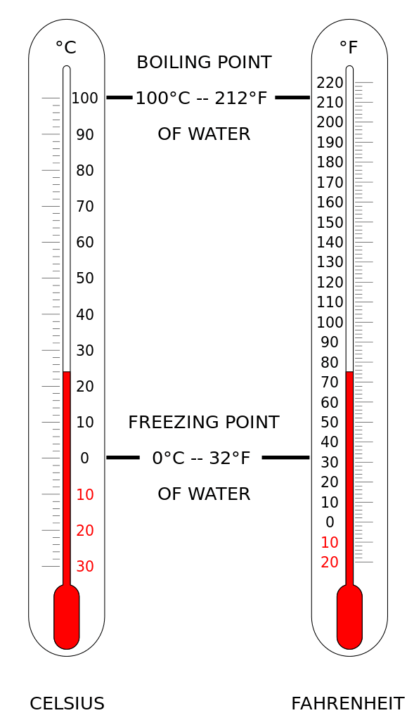 An industrial thermometer is shown in Below Figure (Right). A bulb which acts as a container for the functioning liquid where it can easily expand or contract in capacity. A stem, “a glass tube containing a tiny capillary connected to the bulb and enlarged at the bottom into a bulb that is partially filled with a working liquid”. A temperature scale which is basically preset or imprinted on the stem for displaying temperature readings. Point of reference i.e. a calibration point which is most commonly the ice point. A working liquid which is generally either mercury or alcohol. An inert gas, mainly argon or nitrogen which is filled inside the thermometer above mercury to trim down its volatilization. They are comparatively cheaper than other temperature measurement devices. They are handy and convenient to use. Unlike electrical thermometers, they do not necessitate power supply or batteries for charging. They can be frequently applied in areas where there is problem of electricity. They provide very good repeatability and their calibration remains unaffected. They are considered inapt for applications involving extremely high or low temperatures. They can not be applied in regions where highly accurate results are desirable. As compared to electrical thermometers, they are very weak and delicate. Therefore, they must be handled with extra care because they are likely to break. Besides, they can not provide digital and automated results. Hence, their use is limited to areas where only manual reading is adequate, for example, a household thermometer. Reading temperature via liquid-in-glass thermometers call for brilliant eyesight. Liquid element contained in a glass thermometer may be perilous or risky to health owing to their potential chemical spills. These thermometers display temperature either in Celsius or Fahrenheit scales. Thus, temperature conversion would be needed if the temperature reading is wanted in some other scale. This type of thermometer was developed by a German based physicist named Daniel Gabriel Fahrenheit. It consists of mercury as a liquid filled in a glass tube. On the body of the glass tube, calibrated marks are provided which facilitates the reading of temperature. A bulb is formed at one end of the thermometer which contains the largest part of mercury. The expansion and contraction of this mercury size is then further increased in the extremely thin bore of the glass tube. It aids in increasing the sensitivity of the thermometer. In general, the area over the mercury is filled with inert gases like nitrogen. However, this area can be left evacuated too. Various types of mercury-in-glass thermometers are available. “A maximum thermometer is a unique kind of mercury thermometer which functions by having a constriction in the neck close to the bulb. The mercury is forced up through the constriction by the force of expansion as the temperature increases. When there is a decrease in the temperature, the column of mercury breaks at the constriction and cannot return to the bulb and will remain stationary in the tube.” By means of a maximum thermometer, one can measure the maximum temperature over a predetermined time span. Resetting of the maximum thermometer is a very simple process which just requires the sharp swinging of the thermometer. The freezing point of mercury is – 38.83°C at which it gets solidified. However, it doesn’t result in expansion upon solidification and hence there will be no danger of glass breakage of the thermometer tube. Whenever there is rise in temperature, the nitrogen gas filled above the mercury in glass tube usually comes down the column and gets stuck there. This whole action may affect the functioning of thermometer. To prevent this difficulty, one must manages to get mercury thermometers inside when the temperature drops to – 37°C. In areas, where the upper temperature limit is – 38.83°C, one may employ a mercury-thallium alloy thermometer having a freezing i.e. solidification point of – 61.1°C. Alcohol thermometers are replacing mercury thermometers in many applications. They employ alcohol as the filled in liquid in glass tubes. The temperature measurement range of alcohol thermometers varies from 115°C to 785°C, where former is the freezing temperature point of alcohol and latter is boiling temperature point of alcohol. A typical thermometer for getting environmental temperature readings is required to have a temperature range of -20°F to 120°F i.e. -30°C to 50°C. Alcohol, being a volatile substance may result in parting of the column in the thermometer due to mechanical shock. The column can then be joined again by making the thermometer fall over a wooden surface enveloped with lots of paper sheets. “Hold the thermometer in a vertical position, bulb end down, 4 to 6 inches over the wood surface covered with paper, and then drop. After the thermometer bulb strikes the paper, catch the thermometer with your other hand to prevent breakage. Small amounts of alcohol may cling to the portion of the capillary tube above the alcohol column.” High temperature portion of the thermometer can be warmed up beneath an incandescent lamp which will bring the alcohol down to the column. One can also mount the thermometer vertically for overnight which will let the drawing back of alcohol to the column. This thermometer should never be employed with a parted fluid column since it generally leads to incorrect temperature measurements. Also Read : What is Temperature ? What is a Barometer ?